This boys’ bedroom was already pretty cute to begin with. But Beth, who writes the popular blog (and one of my new favorites) The Stories of A to Z, had some creative ideas for improving it. First she took the bunk beds apart. Then she added some beadboard wallpaper and topped it with a rain gutter book ledge. I love the idea of creating a book ledge from a rain gutter. You can read all about her project here. Moments after finishing the room, Beth’s boys were already checking out the space–and the books! Visit The Stories of A to Z to see photos of the rest of the room and read about all of the individual projects that went into the makeover. *October 2012 Update: Beth just redecorated the room again and it’s even cuter, if you can believe that. Check it out here. .-= Amanda @ Serenity Now´s last blog ..27 Days of Thankful, #15 =-. Beth did a very good job! It is inspiring to redo my son’s bedroom! Thank you! .-= Greet´s last blog ..Ten things about me =-. .-= Beth@The Stories of A2Z´s last blog ..Dining Room Chair Update =-. I have not been to her blog….thanks for the heads up Julia….I will check it out !!! What a wonderful idea! I love the colors and the wee between table. : ) My older brothers’ bunk beds were very much like the ones of A and Z. Great job! ps That cupcake is sweet! .-= Janell Beals´s last blog ..Table Happiness! =-. .-= Jane @ Beach House´s last blog ..Head of design? =-. Oh….so love! 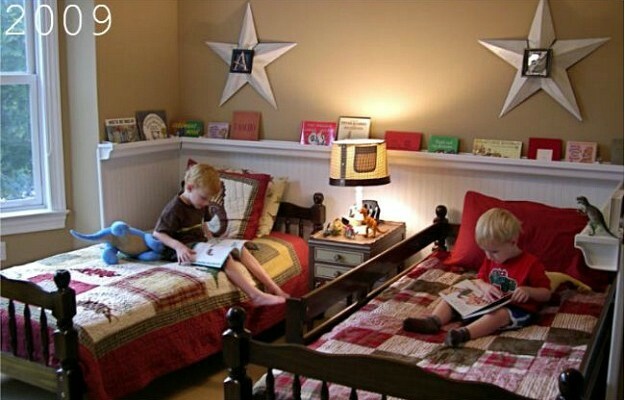 Books and boys are the best…and that room…that is perfection! .-= linda@LimeintheCoconut´s last blog ..Chair love…or not? =-. Great feature, Julia! Beth has quickly become a good bloggy friend and I love how she comes up with so many creative ideas on a budget. She is truly an inspiration! .-= Jeannine Wayman´s last blog ..Give-Away =-. 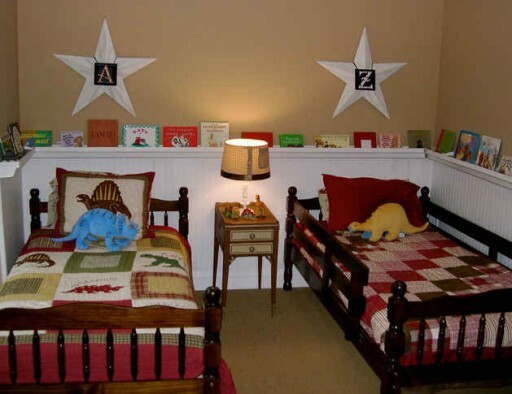 This is such a cute bedroom for little boys. When my kids were little, they were always into the books…actually, they still are. Julia-I had already seen this and don’t know what is cuter–the room or the boys! Besides the darling room, I love that she is making books such an important part of their lives—she is creating a habit for a lifetime…a good one! Thanks for showing us! I think Beth is so creative. I had so much fun doing my little girls room and had fun doing my boys room in a nautical theme but now they want a change so we have been collecting items and can’t wait to get their new themes done–one wants vintage baseball and another wants the Australian jungle. This is a great post. I like the idea of the beadboard with the ledge. Makes for an interesting dimension in the room as well as serving a wonderful purpose. .-= sarah´s last blog ..Camïeue Blue Monday Continued =-. Gutters? Oh my gosh how brilliant is that. I need to spend more time in my hardware store for sure. Love the room. .-= Lori E´s last blog ..METAMORPHOSIS MONDAY: NOW I’M COOKIN’ WITH GAS =-. Awe, I love it, love it, LOVE IT! I have to try this one for my boys room. Thanks for sharing! p.s. I can’t find the follow button?? .-= Michelle´s last blog ..Sunday Favorites hosted by Happy to Design =-. I love every detail of this room!! That rain gutter book ledge is brilliant!! .-= Karen – The Graphics Fairy´s last blog ..Craft Project – Thanksgiving Burlap Napkin Rings =-. Julia…love this Before and After! Isn’t it amazing how much the wallpaper looks like actual beadboard? 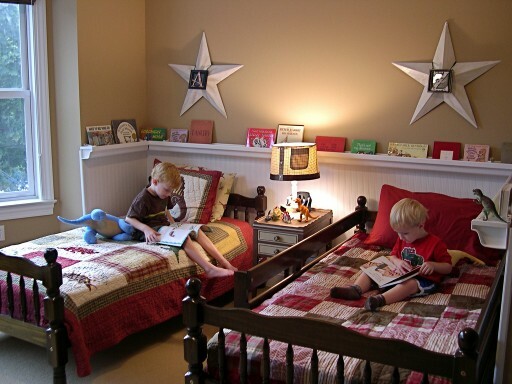 Love the books displayed around the room…such a cute room! Thanks so much for mentioning the Give-a-Way! .-= Susan´s last blog ..Welcome to the 44th Metamorphosis Monday and the Perfect Gift, Give-a-Way! =-. wow this turned out so cute! .-= Diann @ The Thrifty Groove´s last blog ..Menu Plan Monday =-. What a clever idea! Thank you so much for sharing it! LOVE the room! I’m especially loving the rain gutter book ledge. Very clever. One of my neighbors had hung some gutter pieces from a fence, and planted them with trailing vines and flowers….another very clever use of gutters! .-= Sharon~Serendipity´s last blog ..Kitty Cat Christmas Card =-. How creative. So cute. I bet the boys love their new room! .-= Allison´s last blog ..Foyer Rug Before After =-. .-= Marty´s last blog ..Met. Monday – A Little Holiday Decorating =-. Oh my, I love the gutter idea–who knew?! .-= Kim @ Cheap Chic Home´s last blog ..Some Thrifting Days are Diamonds… =-. I fell in love with this when I first saw it! In fact, it so inspired me to tackle my boys’ rooms. It looks straight out of a magazine! totally love the raingutter bookshelves! they could work in so many different rooms too, and for so many different uses! coloring books and favorite movies, trinkets from a family vacation, or when they get older: house keys and wallets! I had seen this already and loved it so much that I shared it with my daughter! .-= nannykim´s last blog ..getting ready for Tablescape Thursday =-. .-= Lara Harris´s last blog ..*Christmas*Pup*Paintings*(Available on Ebay Now 🙂 =-. I really want to use that wallpaper on my very long hallway! It always looks so nice. Must convince the other half! .-= Nancy´s last blog ..LuLu Kellogg Jewelry Giveaway & Two Giveaways Right Here =-.